"An emotional story about the choices we make and how they change the course of our lives"
Jenna Stevens returns to her hometown of Georgetown, TX to put her life back together after her divorce. She stands trembling in front of the building she has leased for her kitchen store. It's the closest thing she could think of to use her knowledge as a chef. She's nervous because she knows nothing about running a retail business. Violet Green answers Jenna's ad for a salesperson. Violet has had plenty of retail experience and is looking for a change of scenery in her life. She has experienced her share of bad times as well. It is very evident to Violet that Jenna doesn't have a clue what she is doing. No advertising, no special offers, no coupons for discounts all add up to no business on grand opening day. Jenna closes the store for a few days to start over, letting Violet help her sort out what she had done wrong and making several changes. As she reopens her store, an older couple walks in and asks for Jenna by name. The world she is trying to put back together comes crashing down again. The man and woman are her birth parents that she has really never thought much about. She knew she was adopted, but for them to just show up is unnerving. Serenity and Atomic Johnson appear to be left over flower children. Serenity explains that the universe told her it was time to find Jenna. Jenna is suspicious and very cautious about letting Serenity into her life. However, Jenna's mom, Beth, encourages a relationship with Serenity and that is even more puzzling to Jenna. Why now and not before? Susan Mallery has written a delightful story about turning your life around, making better choices and regaining confidence. The character development of Jenna, Violet, Beth and Serenity will tug at your emotions and have you either cheering them on or feeling their pain. This is a charming story about relationships, romance and love. You'll enjoy reading it! After nearly a decade as a sous chef in a trendy eatery, Jenna is desperate for a change. She's supported her ex- husband's dreams for so long that she can't even remember her own. Until she sees a for-lease sign near her parents' home and envisions her very own cooking store. Her crash course in business is aided by a street-wise store manager and Jenna's adoptive mother. But just as she's gaining a foothold in her new life, in walk her birth parents - aging hippies on a quest to reconnect with their firstborn. Now Jenna must figure out how to reconcile the free- spirited Serenity and Tom with her traditional parents, deal with her feelings for a new love interest and decide what to do about her ex's latest outrageous request. In the end, Jenna will find that there is no perfect family, only the people we love.. I would suggest being sure to have a block of good uninterrupted reading time when you start Already Home, because if you're like me you won't want to put it down. Jenna in an attempt to move forward from her divorce and her fear of creative cooking...not just following a recipe she opens a cooking store. As the review above states it doesn't take long for her to realize the mistake she's made, and she rethinks the concept of the store with her manager and soon to be good friend Violet. However, Jenna is not the only one who is rethinking life...Violet is as well. Already home is mostly Jenna's story, but Violet's story is an integral part of the story, and I like the way Ms. Mallery has blended both stories into one truly touching emotional tale. As I read the last page of Already Home I was more than satisfied with the conclusion, and know that all involved are going on to lead happy, successful lives. However, I should warn you that Already Home is a potential hankie read...have those tissues handy! 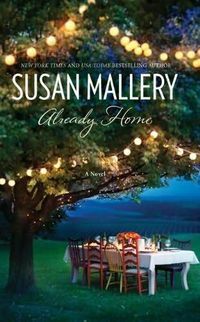 Already Home is an empowering story of new found friends working to overcome abuse, circumstance, and disappointment. Jenna is starting over from an abusive and failed marriage to become an independent business woman by doing what she loves. Unfortunately, bumps in road delay and frustrate her plans but the desire to succeed burns bright. Violet is a secondary story but no less powerful with her tragic past and her willingness to make something of herself. Watching both of these women lean on each other to achieve their goals and help each other become strong women is a beautiful thing.